Witch Of Salem – No Wonder They Used To Burn Them! Have you ever done something, knowing while you were doing it that no good would come of it? You know, like eating week old tuna salad that looked oh-so yummy but didn’t smell quite right, resulting in projectile vomiting and hospitalization? That is the EXACT same feeling I had when playing Witch of Salem, well, without the stomach pump and other unpleasantness. The concept of the game is fairly straightforward, in theory. There’s some portals that lead to another dimension where Lovecraftian “Great Old Ones” (read: big, bad nasties) are awaiting the opportunity to pass through them and use all of humanity as tasty hors d’oeuvres. These demon spawns are assisted by the board itself and the game’s antagonist, Necron, in fulfilling this task, along with a cadre of minions that are all out to get you. The odds are greatly stacked against you the whole, entire time, and calling the game’s baddies unrelenting is the understatement of the week. Once you’ve closed the portals, you have to then identify the Cthulhu uber-demon using your Necronomicons, then defeat said horror via travelling to its dimension and having the correct combination of items required within your inventory. It sounds simple and easy, but unless you’re that kid from “Mercury Rising” and can see the puzzle’s solution just by looking at it, you’re in for one hell of a tough time. As a player character, you are tasked with locating and closing these portals by using location cards to move to one of the six potential portal locations at such garden variety spots as “The Sanitorium”, “The Cemetary”, and the ever-fun “Witch House”. 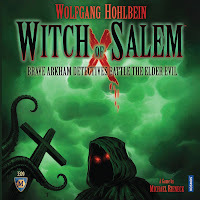 In this you are assisted by the protagonist, Robert Craven, who is the titular Witch Of Salem and provides your players some advantages when your character shares a location with him. Each location has a hidden tile that indicates whether there’s a portal there or a wall, and if you close a wall rather than a portal, not only does everyone playing lose, you don’t realize it until the end of the game. That in itself wouldn’t be so bad were it not for the fact that you are not allowed to tell anyone at the table what you’ve found when you use your mystical glasses item to flip the tile and see what it is. This, in effect, forces every player to try to see every tile to be absolutely sure that the portals are all closed. To add insult to injury, there is a pool of four walls and four portals to randomly place on the six locations, meaning two go back in the box, and so you don’t know until the end if there’s two, three, or four portals. You can deduce fairly easily, provided you’re taking notes, that if a player who had the correct artifact required to close a portal used his glasses to see the tile and then didn’t return to it, that it is likely a wall, but there’s always that nagging feeling that there’s a portal that’s not closed. All of this could be forgiven had this game been more fun to play. At it rests, the game was an effort in futility, and although the difficult decisions that the game mechanics allow for are indeed interesting, knowing that at any point the item you need to have in your limited inventory will likely be snatched by a minion, an activation, or a random roll at any time is simply the icing on the evil cake that embodies this game. This is in addition to the fact that random event cards come into play between turns and upon certain actions, and many of them are ridiculously harmful to your cause. It’s almost like the designers wanted to mimic the phenomenal game “Pandemic” but decided to only allow people to play pseudo-cooperatively by not allowing sharing of critical information, as well as adding an Epidemic card every other turn. It is just that damned hard to win. As an experiment, I have house-ruled that once any portal tile has been seen that it is immediately flipped up for all to see, which transforms the game to a playable level, and becomes instantly more fun almost by some eldritch, unseen force. I just wish I didn’t piss away 4 hours over 2 plays to figure this out. The most offensive part of this game is that the rulebook, which is surprisingly effective in conveying the rules in a short at 4 page format, has some additional rules at the end to MAKE THE GAME HARDER. That’s like giving everclear to a nigh-catatonic, blisteringly drunken man at a bar; it simply defies reason. At the end of the day, this is an exceptionally beautiful game with some really wonky mechanics, but this problem is fixable. The game itself, when going strictly by the rules, is a complete loss but when played with a small modification is actually a decent cooperative romp through a beautifully illustrated example of Lovecraftian mythos. The more I played it, the more I began to enjoy it, but it never really did “scratch the itch” I had hoped it would. If you liked Arkham Horror, you will probably like this, and it is far shorter to play. The theme is wonderful and dark, the gameplay is brisk provided you don’t get caught in a spate of “Analysis Paralysis”. Witch Of Salem has the potential to be a good co-op game, provided you have smart, competent teammates and you ditch the “Vow Of Silence” rule regarding the portals.